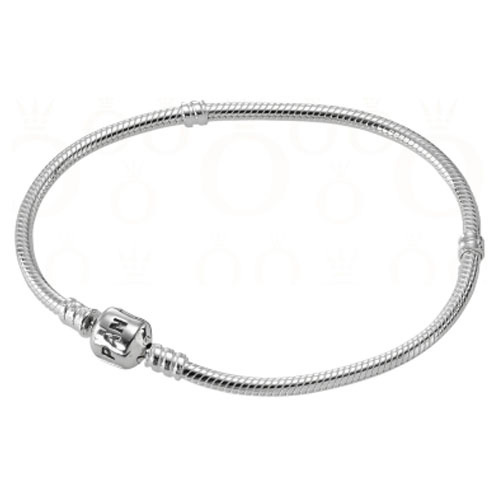 This Sterling Silver chain bracelet features the exclusive PANDORA snap clasp. Available in 6.3", 6.7", 7.1", 7.5", 7.9", 8.3" and 9.1" lengths. To find your bracelet size, take a measuring tape and loosely wrap it around your wrist at its widest point. Take that measurement and round up to the next nearest bracelet size. If you are uncertain about your size, or it is a gift, we recommend 7.1", 7.5" or 7.9" as the most common sizes. The 6.7" bracelet is very small and is best ordered for young girls or women with an extremely petite wrist. Lengths currently in stock: 6.7", 7.1", 7.5", 7.9", 8.3" and 9.1".